New York City’s rise to global culinary eminence begins in prehistory, when glaciers formed the topography that would turn the region into a culinary treasure trove. The American Indians who arrived in the area thousands of years ago would eventually plant the maize, squash, and beans that Europeans and other New World explorers would embrace centuries later. Since the early 17th century, the city has been shaped by millions of immigrants: Dutch, English, German, Irish, Italian, Eastern European, Jewish, Chinese, Japanese, Senegalese, Indian, Bangladeshi, Egyptian, Afghani, Russian, West Indian, and Mexican—to name a few. These nationalities represent the crest of the immigrant tidal waves that engulfed—and enriched—the city, where today 186 national and regional languages are spoken in the public schools. Each group’s food traditions and preferences have added savor and spice to the city’s culinary stew. Some foods retained their distinctive forms and flavors, while others dissolved and disappeared; still others reemerged as today’s familiar favorites—hot dogs, hamburgers, pizza, tacos, bagels, egg creams, cheesecake, falafel, and chow mein. 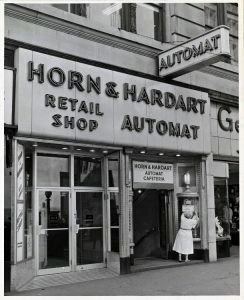 My interest in New York’s culinary history began in the spring of 1991, when I heard that the Horn & Hardart Automat at the corner of Forty-second Street and Third Avenue was closing. Once a thriving chain of restaurants emblematic of New York City’s hustle and bustle, the Automats were distinguished by their unique mechanical food dispensers. Perhaps CHNY members will remember the gleaming rows of small windowed hatches behind which food was displayed. The customer deposited some coins into a slot and turned a knob, and the little glass door popped open: Voilà: Lunch! Behind the wall, workers replaced the dishes with fresh ones as soon as the compartments were empty. It was a modern, efficient, and, to me, fascinating way to get a meal. Some automats were open all night—a perfect fit for “the city that never sleeps.” Their heyday was in the 1930s and ’40s, when tens of thousands of people visited automats every day. By the 1980s, though, the few that remained were dingy and seedy. Even the poorest New Yorkers had long since deserted the once-novel automat in favor of cafeterias, coffee shops, and fast-food chains. Still, the automat was a quintessential New York culinary landmark. I had eaten at only a few of them since arriving in the city in 1977, but I was surprised that they should disappear with so little fanfare, and with barely a murmur of public protest. Automats were gone, but for many of us their fascination lingers on. New Yorkers were reintroduced to the original Automat through an exhibition at the Museum of the City of New York in 2002, and again when the “Lunch Hour” exhibition opened at the New York Public Library in the fall of 2012. The show included a panel of the familiar glass-and-chrome food compartments (alas, empty), and offered the rare opportunity to see what they looked like from the back. For many visitors with fond memories of the automat, it was the high point of the exhibition. 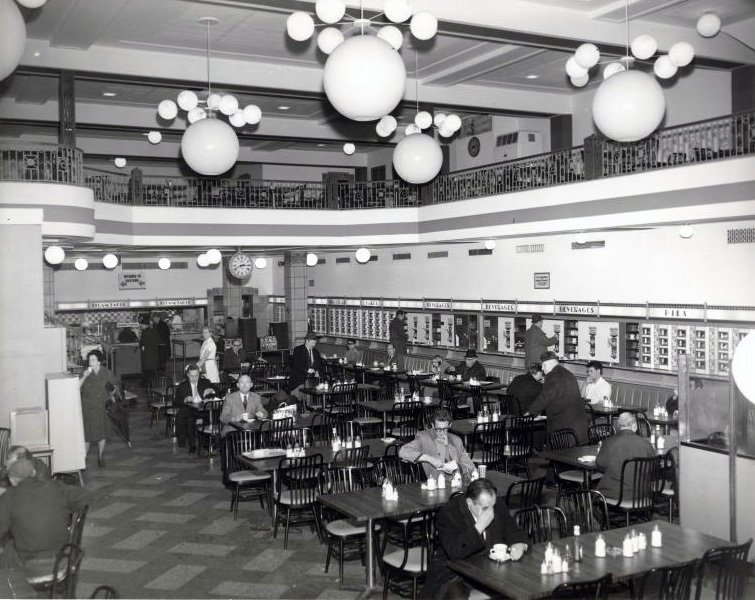 The automat’s demise was just one small facet in the city’s ever-changing culinary kaleidoscope. But I can honestly say that it changed my life. During the last quarter-century I have collected thousands of pages of notes, dozens of books, dissertations, and interviews, as well as newspaper, magazine, and journal articles about the New York City’s food. I have incorporated some of this data into my other books, and into the food history classes I’ve taught at the New School since 1995. I also published a brief culinary history, New York City: A Food Biography. But when I finished that book, I had more than a thousand pages of notes that I couldn’t possibly have included. A number of good books have been published about the city’s culinary life, but, good as they are, I felt that a more comprehensive approach was needed—and it wouldn’t be a one-man job. A number of good books have been published about the city’s culinary life, but, good as they are, I felt that a more comprehensive approach was needed—and it wouldn’t be a one-man job. I approached Oxford University Press about the project in 2013. An editorial committee was selected: Associate Editor Cathy Kaufman; and the Area Editors—Dr. Ari Ariel, Michael Krondl, Dr. Cindy Lobel, Kara Newman, Dr. Jonathan Deutsch, and Judith Weinraub—who designed and selected entries, identified and guided authors, and reviewed and edited their work. Advisory Editor Cara de Silva identified potential topics and writers, and Meryle Evans researched the illustrations. A total of 174 writers, many of them CHNY members, wrote (and rewrote) the 586 entries. I thought I knew a lot about the city’s culinary history and its current food scene, but I was humbled to read the entries that the contributors submitted. 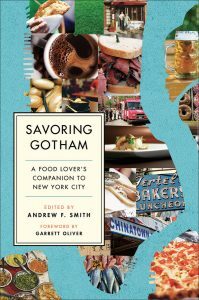 The really good news is that after two years of work and a cast of hundreds, Savoring Gotham: A Food Lover’s Companion to New York City was released by Oxford University Press in November 2015. Andrew F. Smith teaches in the Food Studies Department at the New School. He is the author or editor of 28 books, including the award-winning Oxford Encyclopedia on Food and Drink in America (2013), Sugar: A Global History (Reaktion, 2015), and Savoring Gotham: A Food Lover’s Companion to New York City (Oxford University Press, 2015). He has served as a historical consultant to several television series, including the six-part mini-series, Eat: The Story of Food, broadcast on the National Geographic Network.